After 19 years as Trinity Christian Addison’s (TCA) Head Wrestling Coach, Charles Fergason has announced his intention to retire from coaching after this season. Including his years serving as a youth club coach, Coach Fergason has dedicated almost 30 years of his life serving the wrestling community. 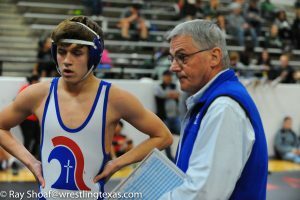 During his time at TCA, his wrestlers have won 214 Team Dual Matches and his teams have won 2 Texas Prep State Championships and had 11 Top 4 finishes at Texas Prep State. 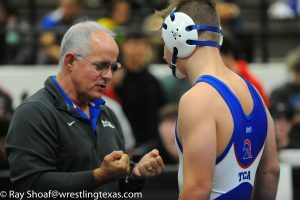 Coach Fergason has produced 29 individual Texas Prep State Champions (w/ 109 State Placers), 11 college wrestlers (including Seven D1, Two D2 and Two D3 wrestlers) and several All-Americans. He has been a long-standing member of the Texas State Prep Wrestling Board and is the Texas State Representative on the National Prep Board. In 2014, he was the recipient of the Lifetime Service to Wrestling Award by the National Wrestling Hall of Fame in Stillwater, OK.
Coach Fergason has been a great advocate for Prep wrestling specifically and the sport of wrestling generally both in Texas and around the country. He’s been a tremendous support to both established and new wrestling programs and has been instrumental in helping new Prep programs in Texas get established. He consistently led the TCA program with great integrity and successfully mentored hundreds of TCA athletes, on and off the mat. He’s a wonderful example of what it means to be a transformational coach. His contribution to the sport and the positive impact he’s made on the young boys he helped mold into young men will be missed. He’s more than earned a long and relaxing retirement with his wife, Heidi and his kids and grandkids. Congratulations Coach Fergason and best wishes in your next chapter!